I was looking for a new drama to watch last weekend when I saw this one. I read the manga before, the story is kinda cute and the main lead, Okada Masaki is a total hottie. Can anyone suggest any other sites? 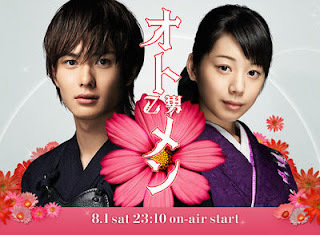 The story centers around the popular high school boy Masamune Asuka (Okada Masaki), the top kendo fighter in the nation. However, beneath his cool exterior, he is actually fond of sweets and shojo manga, and is skilled in sewing and cooking. When he instantly falls for the transfer student Miyakozuka Ryo (Kaho), his secret is in danger of being exposed. I read somewhere that main lead Okada will play Takuma in the adaptaion of Boku no Hatsukoi wo Kimi ni Sasagu, another cute manga. Gotta wait for this too. I haven't heard of this one. I am into another anime right now, forgot the title because the title is so hard to pronounce. Okada Masaki is the man! he's so cute sis ha. In fairness.. mukhang ok din to panoorin kaya lang..will i have the time? haha.. try ko din to. Kdrama: Will it snow this Christmas?